Lin-Manuel Miranda’s groundbreaking Broadway musical “Hamilton” has captivated audiences with its hip-hop inspired, re-imagination of the life of the Founding Father. Since its Chicago premiere last month at the PrivateBank Theatre, the show has been the hottest ticket in town, with orchestra seats going for as much as $1,300. But its influence has extended beyond the stage: New courses at Northwestern University delve into the true history of Alexander Hamilton and the cultural phenomenon that is the musical. Fitz, an associate professor of history with a focus in 20th century America, will delve into such topics as Hamilton’s biography, politics, masculinity, marriage, infidelity and opinions on slavery. In her lectures, she hopes to separate fact from fiction portrayed in the musical. Fitz argues that Miranda’s portrayal of Hamilton as an immigrant can be problematic for some historians. Cadava, associate professor of history with a focus in Latin America, will be tasked with covering the Latino-influence of the musical, whose cast features a lineup of predominately Hispanic and black actors. His lectures will explore the life and career of Miranda and the Puerto Rican diaspora in the U.S., as well as the modern-day influence the production has had on race and immigration. Cadava hopes his course will help re-shape the way professors teach history. Traditionally, he says, history is taught chronologically and is centered before or after major turning points, such as “Pre Civil War,” or “Post World War II.” Much like the play itself, Cadava’s goal is to “re-imagine” the notion of a history education at a time when many professors are lamenting declining course enrollment and waning influence in the humanities. Northwestern will offer another class in January which features a curriculum inspired by the hit musical. “Hamilton: Bullets, Banks, and Broadway” is an interdisciplinary course taught by legal studies professors Laura Beth Nielson and Joanna Grisinger. The class will feature a host of guest lecturers from various departments including theater, African-American studies, communication, political science, English and history. Sept. 22: “Hamilton” creator Lin-Manuel Miranda talks about Chicago, “Sesame Street” and his theatrical blockbuster. 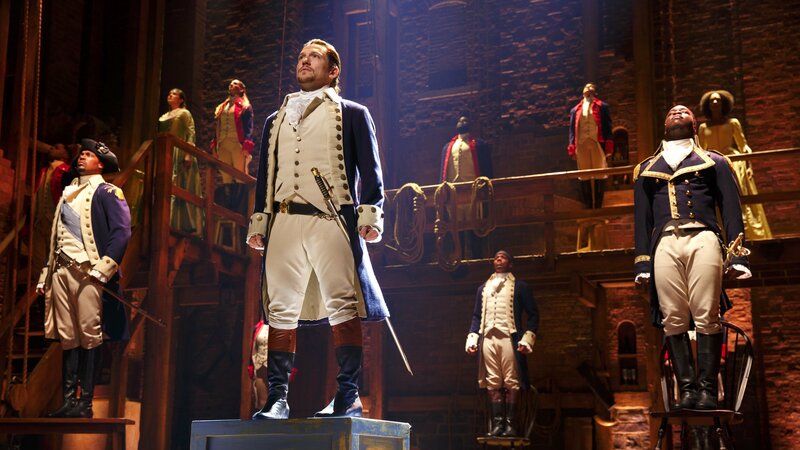 June 29: Crain’s Chicago Business managing editor Ann Dwyer reports on a less conventional way to get those hot “Hamilton” tickets, the newest bank acquisitions in town and changes to the clothing startup Trunk Club. April 5: A controversial casting notice for the mega-hit Broadway show "Hamilton" has ignited a firestorm in the theater world. Has the show's nontraditional casting become reverse discrimination?